When we need to take and share screenshot online, normally first we press Prt Scr button from our keyboard, then open Paint, past it there, save it somewhere in our computer, then upload it to image hosting or file sharing website to share. There is a much better, easier and faster solution called UploadScreenshot. All you need to do is click on Prt Scr button from our keyboard to take screenshot, now go to UploadScreenshot.com, click on Paste (Ctrl + V) button or press Ctrl + V from your keyboard, now it will copy your screenshot from clipboard and they will upload it on their own server. Tip: – Press Alt + Prt Scr to take screenshot of current (active) window. After it gets uploaded, if you think there are some unnecessary portion in your screenshot which you don’t want it to be there, then click on Crop button on top, select the portion you want to make visible in your screenshot and then click on Crop Selected Area! button. Now they will provide you a new shorten unique URL which you can share with anyone you want and they will also provide you some code by which you can embed or link that screenshot in your blog, website, forums or discussion boards. Anyone with the link of your screenshot can view the stats of that screenshot by clicking on Statistics button from top. It will tell you how many times it has been viewed, from which sources people are viewing it and when. If you sign-up for a free account on their website you will get many more options and features, like you will able to manage all the screenshot that you uploaded, you can delete them any time you want, describe your screenshot, you can search for your screenshot, etc. If you are using Firefox or Google Chrome web browser as your default web browser then you can install there Add-on or Extension in your web browser. Tip: – With screenshots you can upload any kind of images on their website, simply right-click and copy your image and then click on Paste (Ctrl + V) button or just drag-drop image file on their website. Note: – To use UploadScreenshot you need to have latest version of Java installed your computer, if it is now installed, you can download it from here and install it. 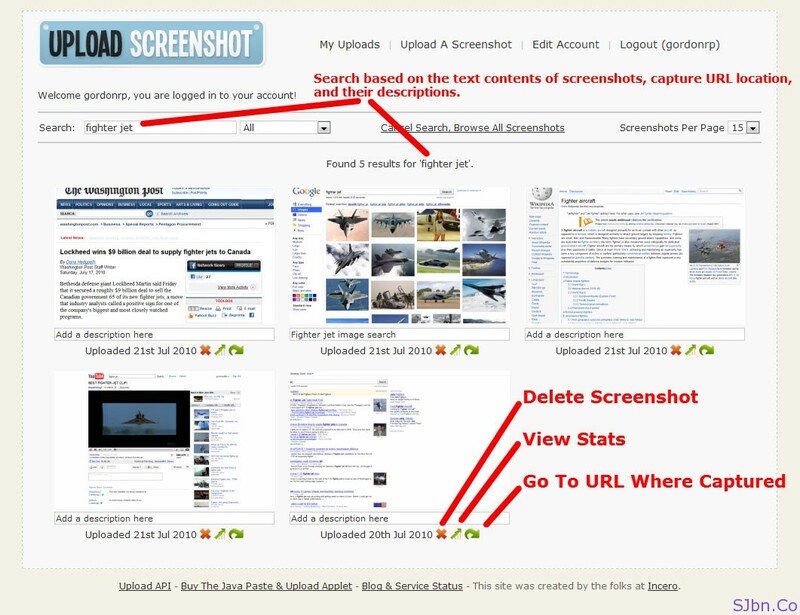 After you open UploadScreenshot.com, your web browser may ask your permission to run Java plug-in you need to allow them.